Free registration, call on 99250 06170. 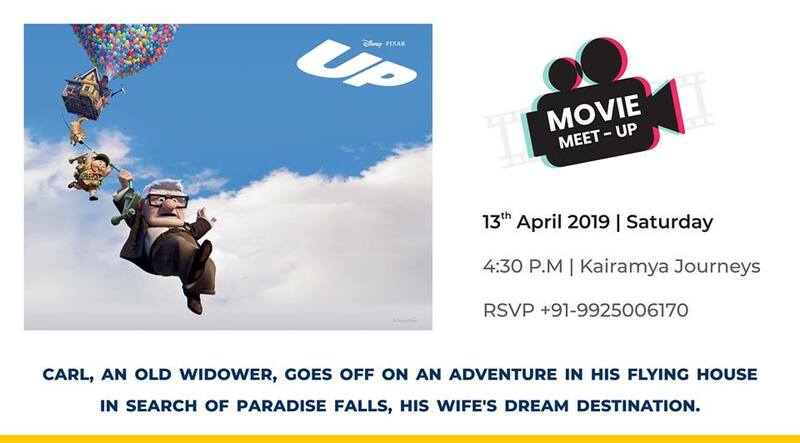 2019-04-13 16:30:00 2019-04-13 19:30:00 Asia/Kolkata Movie Meet-up - "UP"
We are organizing a fun movie meet-up on the 13th of April(Saturday). We would be broadcasting a movie named “UP”. Seventy-eight year old Carl Fredricksen travels to Paradise Falls in his home equipped with balloons, inadvertently taking a young stowaway. First come first serve basis. 10-12 Limited entries. Astronomy Event : Saturn Stands Still! Astronomy Event: The Full Pink Moon ! Book Release - Autobiography "My (Working) Life"
Urban Chowk- The Flea Cafe Opening Soon! Astronomy Event: Moon And Mars Meeting With A Telescope ! Ignite Talk AGS - The Trash Talk, Can Pirana be solved? Parijat - Gujarati Sangeet No Jalso! Annapurneshwari - A Tribute to Guruma Annapurna Devi. YES! WE Love You. Collection of short films. Cultures of Peace: Performance Night! Crayons are coming to Ahmedabad! Astronomy Event : Leonid's Shooting Stars ! 1st Ever Nightcrawlers Concert | Book your tickets now! Hit & Run 23.0 - standup comedy open mic. Astronomy Event : Orionids Shooting Stars ! Keh Ke Lenge : We are Roasting because Winter is coming ! Queer Pot Luck + Open Mic: Good riddance 377! Laughter Unplugged - Chaalo Hasiye! Astronomy Event : Venus At Its Best! ગાંધી સંગે મારે રંગે !! Dost tara naam per! Friendships day Celebration! Comedy Drama " Sunder Be Baydi Walo"
અહો જીવનમંય ! અહો રંગમંય ! Dance Fiesta-2018 , Season-13 "यशगाथाओकी भूमी"
Gujarati Drama - "Uchino Swas"
Why don't aliens come to India? Planet Watch - See Giant Planet Jupiter With A Telescope ! Umra Nind Si Kyun Nahi Hoti ? અાવવું છે? Heritage City Ahmedabad "Tour On Wheels"
Food For Thought 6.0 "Where Hunger Meets Kindness"
Jis Lahore Nai Dekhya, O Jamyaa E Nai! Who all are coming to watch "Lali Lila" ? 12th Chitralekha Natya Spardha- "Ek Hati Tamanna"